The first plugin car warranty that can minimise the time, hassle and expense of catastrophic failure via your mobile. Your industry leading car warranty provides the best combination of price and cover available anywhere and now it comes with a plugin for the ultimate in convenience, advice and protection. Early warning notifications could prevent a third of breakdowns. Immediate diagnosis, meaning we’ll have you in and out in no time. Repair protection with the UK’s best car warranty cover. car warranty do for you? The latest wireless technology allows MotorEasy engineers to monitor performance and predict problems and failures before they happen. Repairs required will be flagged and you will be directed to one of MotorEasy’s 10,000 garages nationwide. Now you know that your car’s really performing! Now we can both see if your car is performing at its optimum. Monitor your car’s well-being from any device and be confident that you are driving safely, efficiently and that nothing is going on that you need to be worried about. Your fitC and our experts will let you know as soon as your car needs a check or a repair. Early advice of reduced performance. No more freezing mornings when the car won’t start. Battery failure is a slow process that we often don’t see coming. The fitC lets us both see battery condition and flag-up the need for recharge or replacement with minimum inconvenience. Reminders before your car’s service is due and the option to book it into one of 10,000 nationwide MotorEasy approved service centres. We stand by your side, making and monitoring your booking, checking the work and ensuring best prices. Whether you want to monitor your driving standards or other family members, fitC lets you see how your car’s being driven, helping you check how to improve fuel economy and drive safer. Forgotten where you parked, or has somebody driven it away, or has it let you down? We can tell you where it is or advise the relevant services where to look. What does a fitC car warranty include? 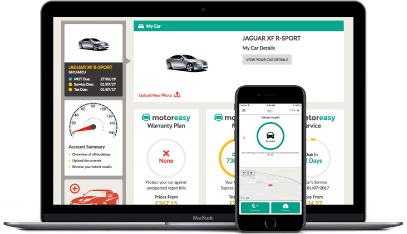 fitC is a brand of MotorEasy, a market leading car maintenance and repair provider, that has been designed to provide a better experience for car warranty owners. How do I use fitC? The fitC device is installed into your vehicle and works in the background. Once purchased, simply log on to the fitC Portal or use the fitC App to register, activate and view your car’s data. What happens if I cannot find where to install my device? If you are having problems installing your device or cannot find the OBDII diagnostic socket in your car, please login to your MotorEasy account where there is more information. If that fails to answer your query please call our technical support team on 0800 131 0001. What happens if I change my vehicle when using fitC? In this instance, we can transfer or cancel your fitC car warranty, to do so please call us on 0800 131 0001. If there is a problem with the fitC device or your fitC Portal / App access, please call our technical team on 0800 131 0001, or email info@motoreasy.com. If there is a problem with the device that we cannot fix, we will organise a replacement device for you. How do I log onto the fitC Portal? Once you have bought your fitC car warranty your account will be automatically activated for use on the fitC Portal. Once you have received your device (within 5 working days), simply go to https://motoreasy.trakm8prime.com and you’re ready to login with fitC. How do I download the fitC App? What do I do if I don’t want to keep my fitC car warranty? Should you wish to cancel your fitC car warranty you can do so within our 14-day cancellation period. If a continuous plugin plan has been purchased a cancellation fee of £75 will apply for the plugin device during the first two years of cover, including this 14-day period. I have a complaint who should I send it to? In the first instance please call our technical support team by calling 0800 131 0001 who will be happy to assist you. Alternatively, please send your complaint to info@motoreasy.com. What do I do if I lose my device? Call our technical team on 0800 131 0001 and we’ll send you a new one, unfortunately there will be a charge. Does fitC conform to current legislation? Yes, you can view our conformity here. If you forget your username or password then you can call our technical support team on 0800 131 0001. Please make sure that you have the name, address and email address used to register on https://motoreasy.trakm8prime.com to hand when you call so we can find you on our system. Once the devices is installed, data will be sent to analyse your driving style and vehicle health. This includes harsh braking, harsh acceleration, harsh cornering, excessive revving, excessive accelerator pedal usage (throttle), location, distance and route travelled by using GPS technology. This information will be used to build up a profile of how, where and when your car is being driven. We will also collect information of any fault codes reported by your car and its battery health. We will analyse the data we collect to build a picture of your car’s health as well as your driving behaviours. We will process any personal data we collect in accordance with the Data Protection Act 1998. For more details, please refer to the Terms & Conditions. All driving data, transferred between all relevant parties, adheres to the highest level of security. We always ensure that our customers have the same level of security as any major partner. For more details, please refer to the Terms & Conditions. How do I set up and install the device? To set up your fitC device you’ll need to activate it by following the instructions in your welcome email. Your welcome email was sent when you purchased the fitC car warranty. To activate your account in the MotorEasy Portal, you will need the details of the device's IMEI number and your vehicle registration. The IMEI is the 15-digit number printed on the device label beginning 3533. The OBD port is the On-Board Diagnostics port (commonly known as the brain of the vehicle); this is where the telematics device or a mechanic gains access to all vehicle data, including speed, RPM, faults and much more. What should I do if I cannot locate my car’s On Board Diagnostic (OBD) connector? fitC is a simple plug and play device for all compatible vehicles. Login to your MotorEasy account for details on locating the OBD port on your car. If you require any help then please call our technical support team on 0800 131 0001. Can I install my device while the car is running? No, you should ensure that you have the ignition off when you connect the device to your vehicle’s OBD socket. I plugged my device into my OBD port but I don’t see any data when I log into the fitC Portal or MotorEasy fitC App. Why? Once you have registered your fitC device on the MotorEasy fitC Portal the device is live. Journey data will be displayed from your next journey onwards. If you have driven your vehicle since registering on the fitC Portal and you cannot see any data, then the device may not be fully plugged into the car’s OBD port – we kindly ask that you check this first. If you still experience difficulties please call our technical team on 0800 131 0001 as they will be able to advise you on what to do next. I installed my device and it won’t pick up my current location. Why? Your device relies upon GPS to determine vehicle location. Location accuracy is subject to GPS accuracy, which means that it could take minutes for a first‐time position to be available and it may not work inside garages or in other such structures. Do I need a smartphone to use the fitC App? No, once you set up your fitC account, you can sign in to it through the internet by visiting the MotorEasy fitC Portal here: https://motoreasy.trakm8prime.com. 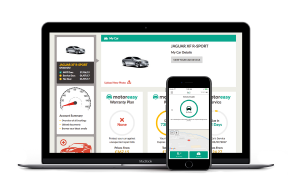 The MotorEasy fitC App is available to download for free on the App Store and Google Play™, simply search your app store for “MotorEasy Car Warranty”. What does my fitC overall score mean? The overall percentage score is representative of how you drive and is calculated by the average number of harsh driving events that were recorded per 100km. A higher percentage score indicates that you are driving well and vice versa. What if I haven’t driven 100km in my chosen timescale? If you’ve not yet driven 100km, then we will use the average for the actual distance you have driven and convert this to a representative average per 100km. Driving sensibly to the conditions of the road, having good road anticipation (preventing excessive acceleration and braking) and no excessive speeding leads to a better score. You will be given a score for each separate aspect of driving to help you understand the areas you should try to improve. I have a ‘Check Engine Light’ on [on the dash] but there are no faults found on the vehicle health page. Why? Diagnostic codes will automatically be scanned whilst the device is installed. However, your car may have manufacturer specific codes that they have not shared with us, this prevents the device from properly reading these codes. If a warning light comes on call our repairs team as soon as possible on 0800 131 0001 and we will arrange a garage diagnostic for you. A fault code has been reported on the app or driver portal, but there isn’t a light on my dash. What should I do? Call our repairs team as soon as possible on 0800 131 0001 so we can advise you of what to do next. What is the Battery Health screen? 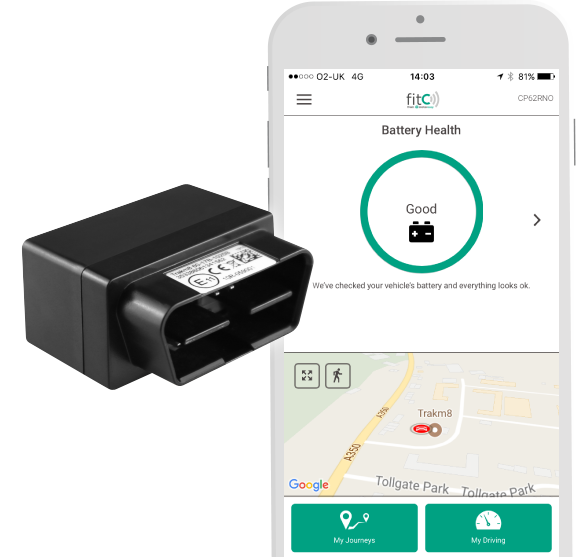 The fitC device is monitoring your car battery voltage and recovery time after an engine start up. fitC monitors various values within the electrical system of your car to give a Battery Health status. If we consider your battery to be in good condition you will see a green ring. There are also orange and red status’s which are detailed below. The battery health screen shows an orange circle with a ‘charge battery’ message. Why? An orange circle indicates that your battery is still good, but that the health is starting to deteriorate and may need charging soon. What action should I take if the battery health screen shows an orange circle with a ‘charge battery’ message? We've checked your car's battery and the voltage looks low. This may be caused by a light being left on or a door not being fully closed. This could also be caused by the car being used for lots of short journeys. The battery will normally be re‐charged by the car during a 45-minute drive. The battery health screen shows a red circle with a ‘check battery’ message. Why? We've checked your car's battery and it looks like it may be failing. You may have a problem starting the car in the near future. Get in touch with us on 0800 131 0001 and we will arrange a replacement battery. What action should I take if the battery health screen shows a red circle with a ‘check battery’ message? My car battery has been replaced but the battery health screen still shows a red circle with a ‘check battery’ message. Why? Don’t worry, the engine will need to be cycled a couple of times before the app will update. Will I be able to check the battery health for my hybrid car? No, unfortunately battery health is currently unavailable for hybrid cars. How do I properly remove my device? 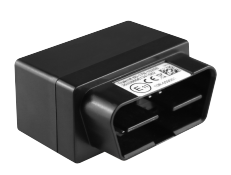 If possible, support the car OBD connector housing and gently wiggle the device as you pull straight out and away from the vehicle connector. Note that the device is designed for a snug fit and may require a strong pull to fully remove it. Why is it hard to disconnect the device from the OBD port? The device was designed to maintain a secure and snug fit on all cars so that it would never come loose or fall off the connector. Cars that are driven on bumpy roads create excessive vibration, which could loosen the device if it weren’t designed for a snug fit. Should I disconnect the device before putting my car in for a service? We recommend that when putting your car in for a service that you disconnect the device and store it in a safe location so you can reinstall it later, following the installation procedure. What should I do if I want to return my devices? If you need to return your device we will provide a prepaid address label which can be obtained by emailing info@motoreasy.com or by calling 0800 131 0001. Please tell us why you are returning your device, so we can process the return properly. Can I cancel my fitC car warranty? Yes, the standard warranty terms & conditions apply which can be found in your warranty document. If you have purchased a continuous plugin plan an additional cancellation fee of £75 will apply for the plugin device during the first two years of cover. What should I do if I am asked to return my devices? If, for any reason, our team ask you to return your device(s) then we will automatically provide you with a prepaid address label and instructions on what to do next. 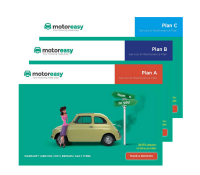 If you have any questions then please contact our team by emailing info@motoreasy.com or by calling on 0800 131 0001.